Turf Confidential: MC: Hawkes slams the "Makybe Cup"
This year's post-mortem on the Melbourne Cup features widespread criticism of the VCR committee for accomodating the ultimate winner, Makybe Diva and international campaigner, Vinnie Roe by watering the track to their liking before the big race. Patrick Smith in The Australian pulled no punches: "To watch VRC and Racing Victoria officials scurry about the international connections it is easy to perceive they are cared for more than some of the locals. And to see the club's man in charge of strategic marketing, Dr Stephen Silk, hurry about with Makybe Diva badges it is just as easy to perceive some locals are better treated than others." And losing bookmaker Michael Eskander was also scathing in his criticism: "The VRC has a lot to answer for. Where is their integrity? Their actions have tarnished Australia's great race. 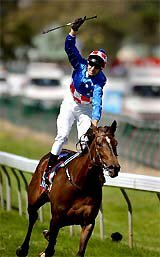 Makybe Diva is a great horse and her connections have worked hard and deserve their win, but this will go down in history as a victory that was willingly aided and abetted by the VRC." Rival trainers John Hawkes (Railings), Gai Waterhouse (Mr Celebrity) and Richard Freyer (Leica Falcon) and the connections of Japanese entry Eye Popper, all complained over the decision to water the track to a reading of dead. "I thought it was the Melbourne Cup, not the Makybe Cup," said Hawkes.